Bull fighting is normally associated with Andalusia or Madrid. 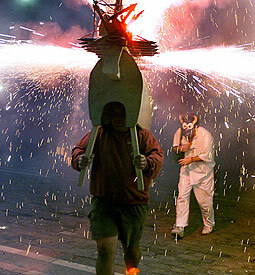 However, it is also present in the Basque Country, not only in the traditional corridas, but also in other events like Sokamuturra, zezen-suzko and the Running of the Bulls in Pamplona every July (as famous North American writter Mr. Ernest Hemingway enjoyed and latter wrote in his book "Fiesta"). 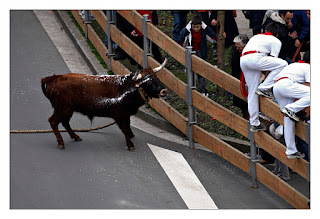 Further more, some historians have found that the origin of the Corridas are in the Basque region. And centering in the "Corridas" there are an interesting museum that covers the history of the bullfigthing from the Enlightenment until nowadays. The Bull Fighting Museum of Bilbao. Attention because it is open on Mondays but closes on weekends! Of our series Mondays in Museums. Related information: Balenciaga Museum, Bilbao is not only Guggenheim and Guggenheim Museum.